Recently sold to a major American Library. DEVILS & DEMONS. 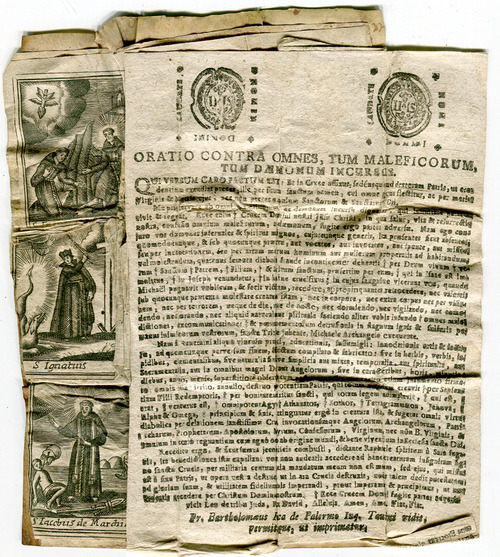 A very rare Jesuit pocket devotional, with prayers against devils, one issued by the Inquisition in Turin in the late 16th century. It has been assembled, in the early 18th century, either by a priest, or a European traveller, to protect them against demons and other dangers. Oratio Contra Omnes, tum Maleficorum, tum Daemonum Incursus. A prayer against those who use the art of the devils. It bears two printed stamps of the Jesuit order. Woodcut and letterpress. “Fr Bartholomaeus Rocca Palermo Inq [uisitor] Taurini vidit, permittitque ut imprimatur.” This is the imprimatur of Fr. Bartholomeus Rocca de Palermo Inq. Taurini (of the Inquisition in Turin). 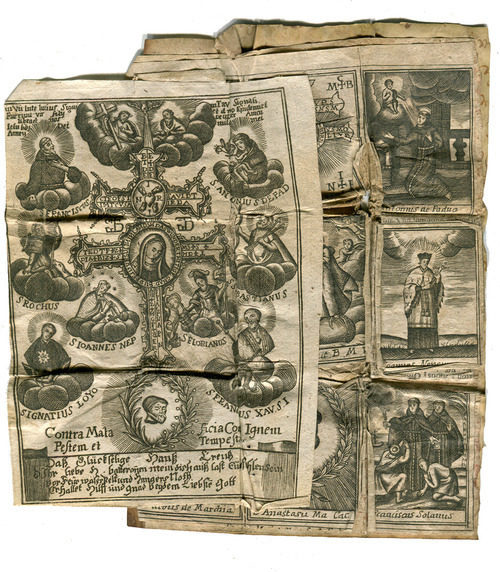 The two prayers are accompanied by 9 small vignette woodcuts representing St. Anthony of Padua, St. Athanasius, John Népumocène, St. Ignatius of Loyola, and others. These are mounted, onto an earlier, possibly 17th century French vellum manuscript document. Four of the vignettes lift up to reveal further portraits of Saints, as well as the two folded prayer sheets. The devotional folds into a pocket size piece. Some creasing and worn in places, but a rare survival of such an ephemeral and fragile item. This entry was posted on Thursday, August 15th, 2013 at 6:58 pm	and tagged with antiquarian books, demons, devils, Inquisition, jesuits, rare books, Society of Jesus, Turin, witches and posted in Unique & Ephemeral. You can follow any responses to this entry through the RSS 2.0 feed.